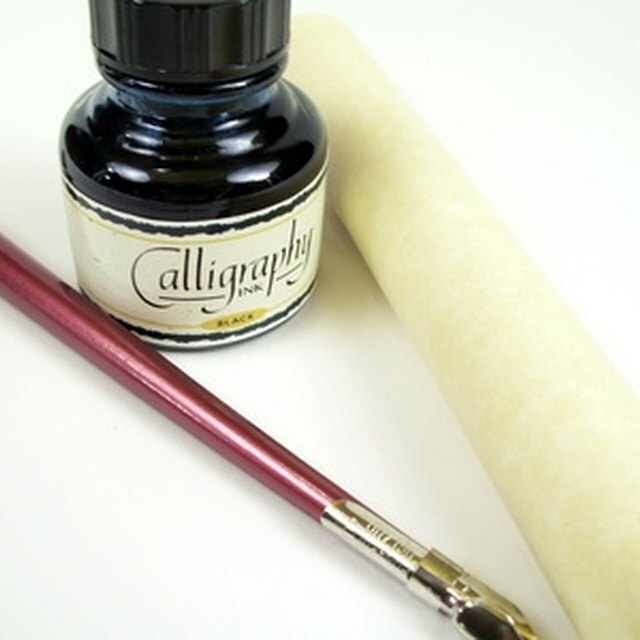 The twin tools of pen and ink have been in use since approximately 2500 BC, when Chinese and Egyptian societies independently developed writing ink. Today, pen ink is produced following a similar formula now as it was then: a color-rich substance is suspended with stabilizers in a liquid that a pen can push across paper. Innovations in chemistry since have added variety to ink's chemical composition. Pen ink's most obvious ingredient is dye or pigment, but it also contains polymers, stabilizers and water to help the ink flow properly. An ink's color comes from either a dye, which can dissolve in water, or a pigment, which is water insoluble. The dye eosin lends red ink its color and is made by adding the element bromine to a fluorescent compound. Inks that employ pigments include white ink (which contains titanium oxide) and metallic gold ink (which, surprisingly, uses a copper-zinc alloy.) Carbon black, a pigment derived from coal and oil, is an essential part of black ballpoint pen ink. Inks may clot when their dye or pigment particles clump together. Stabilizers prevent clotting by adhering to molecules and moving them past each other, giving ink a smoother flow. Polymers, large molecules made from chains of basic repeating units, are excellent stabilizers. In the past, plant resin and egg albumin served among the sources of stabilizing polymers. Laboratory creations like polyvinyl chloride and polyvinyl acetate later filled this role in the twentieth century. Early forms of writing ink consisted of stabilizers holding fuel residue in perhaps the planet's most abundant liquid solvent: water. Centuries later, manufacturers began employing other chemicals as solvents. Petrochemicals, built mostly from carbon and hydrogen, continue to be used in ballpoint pen inks. Felt-tipped pens depend on ink made with alcohol as the solvent. Yet recent restrictions on the use of carbon-based compounds in industry have caused manufacturers to return to the idea of water-based inks. Research also has suggested other additives that can improve ink's basic qualities. Glycerides, which contain fatty acids and the alcohol glycerol, can be obtained from plants and added to make ink glide more smoothly over paper. Chemicals that regulate ink's pH, such as triethanolamine, keep ink from becoming so acidic or caustic that it damages pens. Some additives even directly benefit manufacturers; clay, which contains silicates, successfully functions as a “filler” ingredient in pen ink. Johnson, Sheila. "What Is the Chemical Composition of Pen Ink?" Sciencing, https://sciencing.com/chemical-composition-pen-ink-17194.html. 29 April 2018.